A variety of kiosk/digital signage organizations rely on Microspace’s VELOCITY® CellCast for high-quality, reliable, and cost-effective digital signage at up to 98% cost savings over terrestrial services. 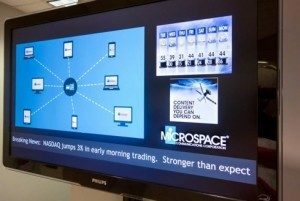 At Microspace, we describe digital signage as a network of digital displays controlled at a central location, which allows a user to alter content to meet the needs and the interests of an audience. We would also describe it as a source of revenue, a way to educate and motivate an audience to purchase goods and services, a means of entertaining a captive audience, or a way to reinforce a brand. 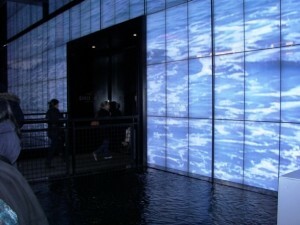 Microspace provides a number of services directly targeted at the rapidly expanding digital signage market. We currently support multiple nationwide signage networks using a number of different services including our wireless service VELOCITY CellCast and our satellite service, VELOCITY. In digital signage applications, we are increasingly seeing the requirement for providers to “bring your own network” (BYON) along with the displays, mounts and players required in a network. This is due in large part to the recent security breaches so many large corporations have suffered. It’s not the only reason though. Other drivers when considering “bringing your network” include the potential for additional revenue, the protection of WAN bandwidth, or the ease of ordering and installing a standalone network. 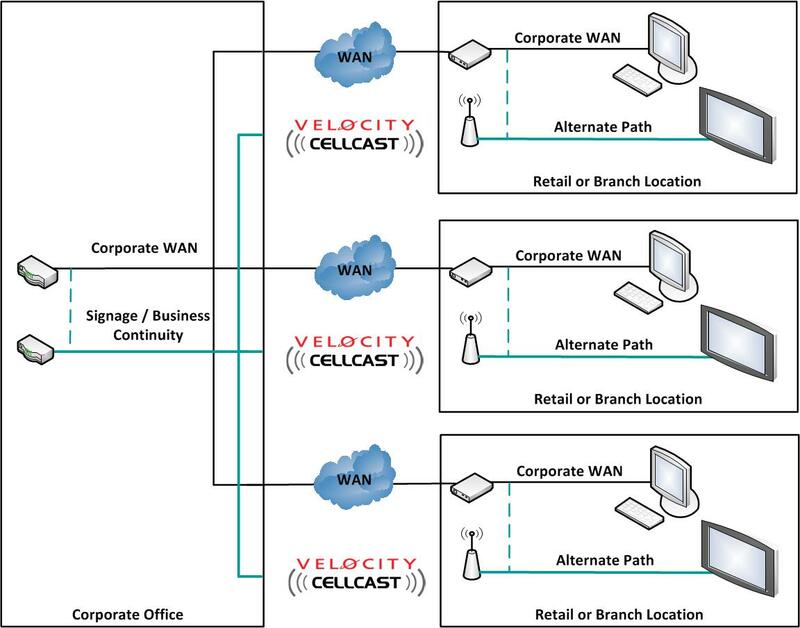 Microspace’s VELOCITY CellCast provides a proven enterprise grade wireless solution for digital signage applications. Content delivery, device monitoring, and award-winning support are bundled together with an appropriately-sized data plan to ensure the most cost-effective solution for your digital signage locations. Advanced features such as bandwidth pooling, WIFI services, and router management are all included in the service. With Microspace VELOCITY satellite content distribution, cost savings can be realized along with the added benefit of a fully scalable and highly reliable solution. VELOCITY excels in large networks and in networks where dedicated bandwidth is an absolute priority. Our satellite services include large-file transfer capabilities and live HD distribution specifically for digital signage applications. See how VELOCITY CellCast was used by Porter Digital Signage to overcome the network connectivity challenges of a small retail space. To provide a complete digital signage network solution, Microspace has strategic partnerships with numerous industry leaders. Together we can build the network that best fits your needs and budget. You want a single company to take the reins to design and roll-out your network? No problem. Through our partner relationships and affiliates, we are able to provide digital signage solutions for companies large and small. Microspace and its industry leading strategic partners will work with you to define, customize and build your network including hardware acquisition, installation, network management and even content creation. Microspace is a charter member of the Digital Screenmedia Association, helping to define the standards for the industry and is a member of the Best Practices Committee. We currently provide digital signage and corporate communications services to thousands of enterprise users across North America.